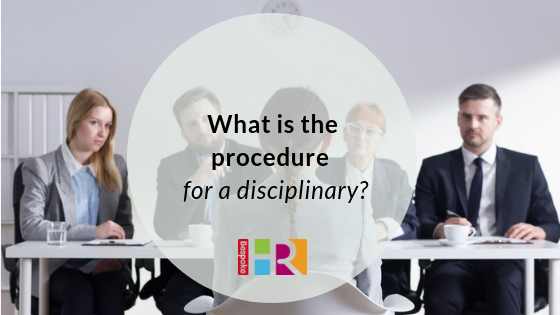 What is the process for a disciplinary? Once the issue has been fully investigated, write to the employee inviting them to a disciplinary hearing, including the reasons why. Give at least 48 hours’ notice and offer the right to be accompanied by a work colleague or a Trade Union Representative. If they cannot attend, give them a chance to explain why and offer them a selection of other dates to choose from. At the meeting introduce those present and inform the employee that notes will be taken. If they are accompanied, recognise the individual and explain that their role during the meeting is to support the employee, to listen to what is being said and take any notes on behalf of the employee. They can ask questions but may not speak on the employee’s behalf. If they are alone, confirm the employee is aware of their rights to be accompanied and that they have chosen to come alone. Explain the purpose of the meeting is to determine whether disciplinary action should be taken. Outline that an issue has been bought to your attention (stated in invite letter) which you feel as a company needs to be addressed. Explain no decision has been made as of yet, the meeting is to hear the employee’s opinions/thought/recollection of events and a business decision will be made following this meeting which you feel is appropriate action. Written warnings normally stay on an employee’s file for 12 months. Briefly outline the relevant evidence and state the employee will be given a full opportunity to state their case. Ask employee to recall their series of events or explain why this matter has been raised. Ask any relevant questions you feel are appropriate. Ensure the employee has confirmed what they have stated (probing and re-validating questions). At this point ask the employee if they have any questions they wish to ask. The questions are most likely to be when they will find out the result, and if this will affect their future employment with the organisations. Explain you will adjourn the meeting for a period of time to give you time to reflect on what has been said today. The employee will then be called back in and a decision will be made known. Any decision will be followed up with a letter to confirm the decision. The employee has every right to appeal against the decision made and has 5 working days from the date of the letter to do so. We can help manage the disciplinary process for you, get in touch to find out how.